Deborah Hutton is a household name. In keeping with her desire for continual reinvention Deborah's interest in the area of personal wellbeing has resulted in her new on-line platform ‘Balance by Deborah Hutton’. Facing 50 and the shock of being diagnosed with a serious skin cancer, Deborah spent more than a year assessing and redefining herself and realised along the way, women not only needed support but also wanted to connect and talk. Balance by Deborah Hutton is an on-line community giving women access to coaches and experts in all aspects of life, from health and wellbeing to career and finance. Deborah interviews the experts to ensure ‘BalanceBDH’ provides practical advice towards living a happier and more successful life. Deborah Hutton's career began when she graced the cover of Cosmopolitan magazine at the age of 16. She went on to become a top international model with contracts in Germany, Italy and New York, working with the world’s top models and photographers. 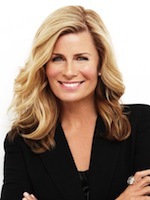 In the years since, Deborah has become one of the most recognisable and best-known personalities in Australia with an extensive television career hosting programs including Looking Good, Location Location, Amazing Homes & Celebrity Overhaul for the Nine network, as well as being an editor of the Australian Women’s Weekly for over 10 years. Deborah joined forces with Foxtel hosting shows for the popular BIO Channel, The Foxtel Movie Show and is currently the host of Foxtel Arts weekly entertainment show ‘Stage & Screen’ which explores everything that’s new in Australian music, theatre, visual arts and books. Deborah is also a savvy businesswoman launching both her range of home-wares “Living with Deborah Hutton” for Kmart, which was a huge success and her own brand of Optical eyewear. Recently Deborah authored her first cookbook ‘My Love Affair with Food’ with a second cookbook in the pipeline scheduled to be published late 2015. Deborah is in demand as a keynote speaker and is renowned as a professional MC who always does her research whether hosting a glamorous awards night or interviewing Australia’s top CEO's as part of a business discussion.